Drag is an incredibly varied art form, but there is one aspect all drag shares: It is inherently political. Whether a queen centers their performance on politics and social justice or distances themselves from current events entirely, the act of getting up on stage in drag is a bold statement, challenging societal expectations and demanding to be seen. RuPaul has made no bones about it: He expects every Drag Race viewer to get out and vote and make their voices heard. Whether through challenges or drop-by visits—who could forget then-Minority Leader and current Speaker of the House Nancy Pelosi dropping by in All Stars 3—Ru has made it a priority to champion political causes and spotlight political discussions. This episode takes that further than ever before, combining the show’s now-standard seasonal call for political awareness and activism with this season’s Rusical. 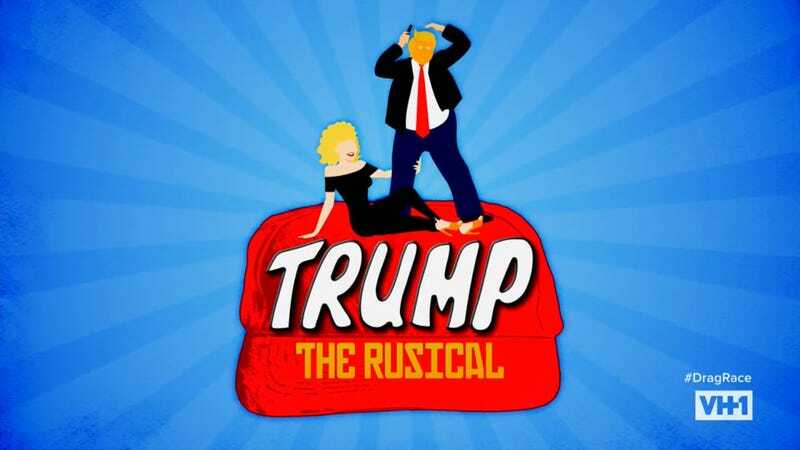 Trump parody is a very saturated market, so while a drag performance centered on the president may seem like a solid jumping off point, it could easily retread very well-worn territory. Thankfully, the Drag Race producers and the writers of “Trump: The Rusical” find just the right balance between pointed political satire, campy excess, and self-aware silliness. Strong writing, along with solid to terrific performances by most of the queens and a good balance of earnest reflection and backstage drama make this not only one of the best Rusicals in Drag Race herstory, but the best episode of the season so far. The episode begins with the queens still very shook by the six-person lip-sync that ended “Diva Worship.” Shuga is particularly nerve-wracked, as the final queen declared safe before Honey was sent home. Viewers have had a week to recover from that mega lip-sync, but it’s important to remember that the queens haven’t. This opening puts the audience right back in their shaking, sequined boots, effectively setting the scene for what will be another ambitious and demanding challenge. The next day, Ru comes into the workroom and announces the next mini challenge, which kicks off the episode’s political theme. The queens need to get into quick Rachel Maddow drag and present a breaking news story, reading off a teleprompter in Maddow’s signature style with no rehearsal, and only one take. The Pit Crew rolls out a set of pixie-cut Rock Star wigs and, after a brief video from Maddow herself, the queens are off. This is another fun mini challenge, continuing the season’s excellent track record. It highlights just how hard it can be to read anything live, and the intercutting between the queens’ attempts and Maddow’s live-read is highly entertaining. Most of the queens struggle, but Brooke Lynn and Ariel do alright and at least two do a pretty good job, Nina and Scarlet. In the end, Ru declares Scarlet the winner and tasks her with casting the roles for the episode’s maxi challenge. It’s time for this season’s Rusical, a campy, original Drag Race musical the queens will perform, lip-syncing to pre-recorded tracks. 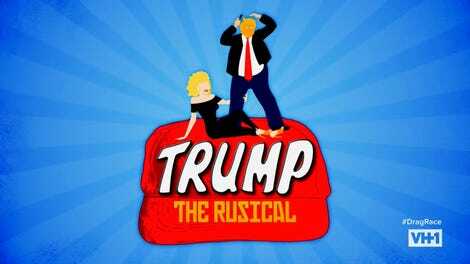 “Trump: The Rusical” is a Trump-flavored spin on Grease, with the queens portraying prominent women in Trump’s orbit. They’ll need to learn the words, capture the essence of their characters’ persona and physicality, and master choreography by Yanis Marshall, all in one day. Ru leaves the queens to listen to the audio track and settle on roles, and they immediately get to work. Sometimes the queen tasked with casting lets her fellow competitors choose their roles. Not so with Scarlet. Mercedes, who has struggled all season, wants the lead role, Shandy, but Scarlet is not comfortable resting the entire show on her shoulders. She casts Ariel instead, though Ariel has no interest in the lead and the extra work and pressure that comes with it. Scarlet snaps up the dance-light role of Betsy DeVos for herself and trusts her instincts for the rest of the casting. Before long, it’s time for Ru’s walk-through. Ru asks each set of queens whether they’re registered to vote and about their relationship to politics, prompting some entertaining discussions. Silky’s hack against gerrymandering is not as interesting as she thinks it is, but Nina’s background growing up in a conservative and politically active family is compelling. Her story about being terrorized in college when she ran for student government is intense and the context she gives, reminding the audience of the brutal murder of Matthew Shepard, underscores the fear she lived in at the time, and that many still live with every day. This touches Mercedes in particular, who hears in Nina’s story her own fear as a Muslim immigrant in America. This helps her talk to the other queens about her faith, and why she was so reticent to discuss it. Mercedes’ talking heads are powerful on their own, but they’re even more so in the aftermath of the horrific terror attack in Christchurch. It takes a lot trust and courage for her to open up about her fears, and the season and the viewers are better off for her decision to share her experiences. These personal, difficult discussions are at the heart of politics. They broaden understanding and help people see the world from others’ perspectives, shaping public discourse and building political will. Any Drag Race episode focused on politics needs this kind of heartfelt honesty. It also needs counterbalancing, lest the weight of the work that needs to be done become unbearable. In this episode, that counterbalance comes from Ra’Jah and Brooke Lynn’s subplot. Brooke Lynn has a background in dance; she was a professional ballet dancer for six years. Ra’Jah also has a background in dance, but what she means by this is that she studied dance through her teen years (she stopped about 15 years ago). These are not the same thing. They’re not even remotely close. In a different season, Ra’Jah’s years of childhood dance training would put her ahead of the rest of the queens. This season, there’s a professional dancer in the cast. It would have been much cannier to underplay her experience and then over-deliver, as Kameron Michaels did with her vocals in season 10’s “Cher: The Unauthorized Rusical.” Instead, she talks a big game then gets in her head and winds up disappointing both the choreographer and herself. Ru’s still not over Team Ra’Jah’s dreadful performance in “Diva Worship” and the shade she happily throws Ra’Jah combined with Ra’Jah’s over-confidence hands the producers a comeuppance edit on a silver platter. This episode is eager to take Ra’Jah down a peg, and it’s a thread that runs from the beginnings of her one-sided tension with Brooke Lynn all the way through the lip-sync. Some of the episode’s best shade comes courtesy of guest choreographer Yannis Marshall. The choreography rehearsal gets a surprisingly large amount of screentime, but Marshall keeps it interesting throughout. Most of the queens seem to be handling the choreography alright, though there’s clearly lots of work for them to do, but Ariel in particular is overwhelmed. The episode does a good job of building the stakes for this performance and as expectations rise, so does the pressure Ariel is feeling. Very little of the choreography shown in the rehearsal makes it into the finished Rusical, diminishing this portion of the episode on second viewing, however it’s entertaining enough to make up for this, if only for the aforementioned Ra’Jah razzing and Yvie sharing that she has Ehlers-Danlos Syndrome Type III, a disorder that makes it easy for her knees to pop out of place. After the queens finish painting and getting ready, discussing how their politics have been shaped by their experiences, it’s time for the world premiere of “Trump: The Rusical.” There are definitely some weak points in the cast, but on the whole, it’s a smashing success. The queens are funny and on point, they handle the choreography they’re given well enough, and the moments that need to land work like a charm. Basing the Rusical on Grease, instead of making it a wholly original creation, was very smart, as was centering it not on Trump, but on the women in his orbit. Several of the queens get solo moments and they each take different approaches. Yvie’s Kellyanne Conway is grotesque, while Nina’s Sarah Huckabee Sanders hams it up. Scarlet’s Betsy Devos is batty and clueless and Shuga threads the needle nicely between doing a fun, campy Hillary Clinton and fulfilling the needs of the show. Brooke Lynn only has a couple moments, but her Ivana is instantly identifiable and Plastique even serves up a surprisingly good Melania, particularly given her miniscule screentime. A’Keria’s Stormy Daniels may not be all that specific, but she works well, as does Vanjie’s Rosie O’Donnell. As the only non-political figure, Ariel’s Shandy is solid and holds the center well, and despite her misgivings with the role, Silky slays as Oprah. That leaves Ra’Jah, whose Omarosa is bland, and Mercedes, who not only fails to be a commanding enough presence as Ivanka, but struggles with her words. Wisely ditching the original Grease ending, “Trump: The Rusical” finishes with a call for civic engagement and more women in politics. Then it’s time for the runway. Category is, appropriately enough: Orange Alert. A few of the queens deliver really strong looks, including Yvie’s circus clown, Ra’Jah’s leotard and chaps, Silky’s beautiful pageant gown, and Shuga’s Trump drag. Almost everyone looks good, though, emphasizing the strength of the queens this season. The weakest look is clear: Mercedes is not matching up to her peers, and it’s time for her to go. Mercedes showed in her “Good God Girl, Get Out” lip-sync that she can be a fierce and captivating performer. Unfortunately, that Mercedes doesn’t emerge this time. From the jump, she’s low-energy and disheartened, while Ra’Jah bursts out ahead immediately. She owns the stage and demands viewers’ attention. Even when her wig comes off—a hilarious capper to the episode-long thread of Ra’Jah getting in her own way—she processes what is happening and keeps going. Mercedes has shown herself to be brave, kind, and creative, but it’s definitely her time. She may not be at the level of the remaining queens right now, but there are glimpses of real talent and potential in her work this season. She’s another queen, like Soju, who could easily come back in a few years and blow the audience away in All Stars. Ginger Minj as Trump! What a fantastic bit of casting. I get what Joel McHale was going for, but he was obnoxious and one of the worst guest judges I can remember. Tiffany Pollard, on the other hand, was lovely, and Rachel Maddow should come back for full guest judge duty. Some thoughts on Silky: She’s one of the break-out stars of season 11, a clear producer favorite, and she’s done well in the mini challenges, talking heads, and workroom exchanges. Until this episode though, she hadn’t delivered in any meaningful way on the runway or in the maxi challenges, and her attempts at drama have felt increasingly manufactured, like her eye-roll-inducing reaction to getting Oprah. It’s one thing to have an eye out for what producers will need in editing and to deliver that in the workroom; see Manila Luzon in All Stars 4. It’s something else to constantly demand attention and call shade, even when being catered to. The queens quickly tired of this from Valentina in All Stars 4 and if Silky doesn’t keep delivering in a big way in both the maxi challenges and runway, fans will tire of her too. I was all but dreading this episode, and my opinion of this Rusical is undoubtedly shaped by my years around community theater, but this is the most pleasantly surprised I have been by a Drag Race challenge or episode in a long time. “Trump: The Rusical” is equal parts damning towards specific women in the Trump administration and ridiculously silly, and the end doesn’t even try to make sense. I had a blast.